But powerful men have powerful enemies–and now, so does Alyrra. Betrayed during a magical attack, her identity is switched with another woman’s, giving Alyrra the first choice she’s ever had: to start a new life for herself or fight for a prince she’s never met. But Alyrra soon finds that Prince Kestrin is not at all what she expected. While walking away will cost Kestrin his life, returning to the court may cost Alyrra her own. As Alyrra is coming to realize, sometimes the hardest choice means learning to trust herself. 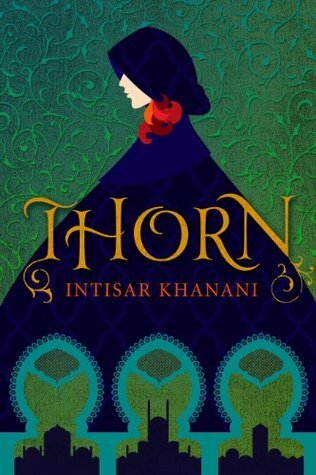 Thorn is a retelling of The Goose Girl fairytale. I’m unfamiliar with the original, but I found Thorn walked an interesting line between fairytale and reality. Yes, it has a prince, a goose girl and a witch. It even has a talking horse. However, it also deals with family abuse, class divides and the devaluing of women’s voices. For me, the setting had echoes of The Horse and His Boy by C.S. Lewis. Part of this was the presence of Falada, the talking horse. Mostly, it was the Arabic feel of the place. Like Lewis’ Calormen, the inhabitants of Kestrin’s kingdom, Menaiya, have darker colouring, the king wears curl-toed slippers instead of boots while at home, and the climate is warmer than Alyrra’s kingdom. However, while there may be superficial similarities, Khanani handles her setting in a more balanced way. Menaiya is never portrayed with the broad strokes of savagery and exoticism that Lewis uses. Instead, we are shown the individuals–some of whom may be cruel, some of whom are kind and many of whom are a mixture. They are people, first and foremost. Complexity and nuance are at the heart of this tale, bringing forth the messiness of life. This nuanced approach also shows up in the relationship between Alyrra and Prince Kestrin. Alyrra has been scarred by the cruelty of her family and so doesn’t immediately trust Kestrin. He may have saved her from her family, but Alyrra remains fearful, assuming he must be just as bad. Kestrin’s fondness for her bleeds through in places, but in his desperation to save himself and his family he doesn’t always treat Alyrra with respect. His privilege also blinds him to some of the realities of Alyrra’s situation. For example, he doesn’t see that the disparity in rank between a prince and a goose girl makes it hard for Alyrra to turn down his invitation to dinner. Nor does he see that accepting the invitation may invite the wrath of the imposter princess. In addition to touching on class divides, Thorn also speaks about the experience of being a woman. Menaiya may not be portrayed as a nation of savages, but it is not a safe place. Women walking the streets alone may be abducted and abused. Reporting such abductions to the guard is useless, as the guard will simply assume the woman ran off with a lover. And women–particularly low-born women–accused of crime can expect to have their testimony disregarded because of their gender, even if their male accuser has no solid proof. This places Alyrra in a precarious position, even as she clings to the desire to lead an ordinary life. The language in Thorn is gorgeous in places, a true delight to read. It’s evocation of the themes of belonging and betrayal about broke my heart in places. The ending was a bit messy, leaving behind a few loose threads. I found I didn’t mind that, feeling it was in keeping with the portrayal of life as a messy and complex experience. I have Memory of Into the Forest to thank for recommending Thorn to me. She read the story for Diversiverse last year and when she told me on it was on sale back in April, I snatched it up. I’m glad I did because I would not want to have missed out on such a poignant tale. Hurray! I’m so glad you enjoyed it. It has been a year for good fairytales. Thank you again for the recommendation! It was such a beautiful story. I think I’m going to have to track down more of Khanini’s work.